Another Christian adventure game, based on the Book of Exodus. You're Moses, and you have to free the Israelites from slavery in Egypt, after seeing a vision of God on a mountaintop. It follows the Bible very closely: Most of the early "puzzles" involve addressing people or places by name, and the game's help feature usually directs you to read a particular passage. Short, easy, and unintentionally funny at times. 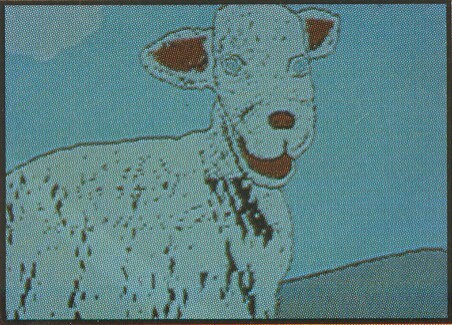 This back-of-the-box screenshot absolutely kills me! Check out my entry on MobyGames for some others. Programmed by Three Rivers Software out of Pittsburgh, published by First Row (Twilight Zone, Dr Dumont). 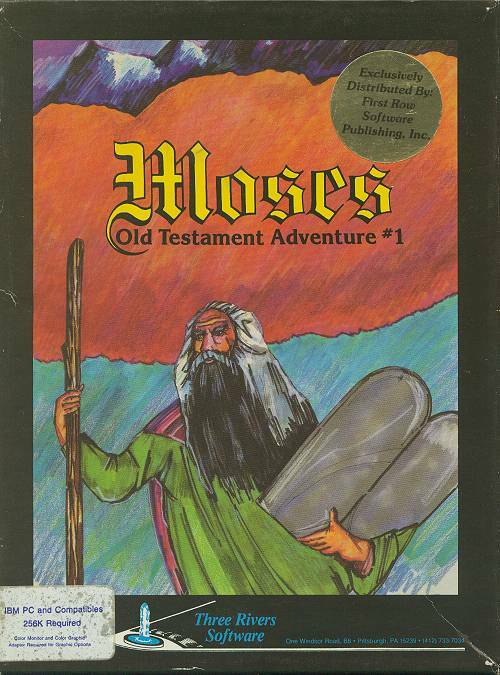 The box calls it "Old Testament Adventure #1", and during the course of the game you can find a flyer for #2 (Noah), but I don't believe it was released. Supports the Aicom Speech Synthesizer, which I've also never seen before.